The RSQ 240 is a sectional open centre valve. It has a max. operating pressures up to 350 bar and a max. pump flows up to 100 l/min. 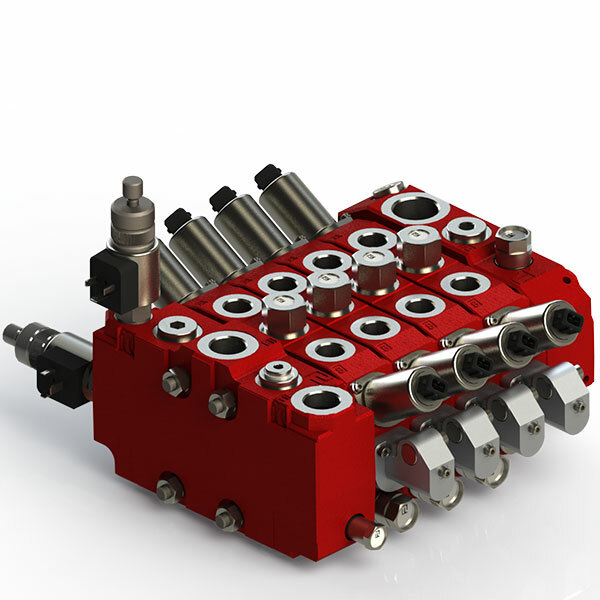 It is available with 1 to 10 working sections per valve assembly. This valve has an open centre for fixed and variable displacement pumps. It also has a unique dual flow range possibility and an ability to facilitate simultaneous operation of several functions. The valve is available with electro-hydraulic or hydraulic proportional remote control, but it can also operate manually. The electro-hydraulic proportional version, in particular, offers a compact design. This is thanks to its internal pilot oil supply, solenoids integrated into the valve body, and integral hand levers for manual override/manual operation. The valve offers excellent operating characteristics because of the specially designed spools for different applications. Finally, low and uniform spool forces are the result of the careful balancing of the flow forces. The flow control (Q-function) of the inlet section bypasses the major part of the pump flow to tank when the system is idling. However, it still gives access to full pump flow when there are services’ operations. Besides greatly reducing heat generation this also provides improved operating characteristics. Two elements give this valve a very high-performance level. First, the Q-function, in combination with the RSQ 240 unique dual parallel gallery functional principle, and separate flow regulation in each working section. It, therefore, gives this valve a very high-performance level.